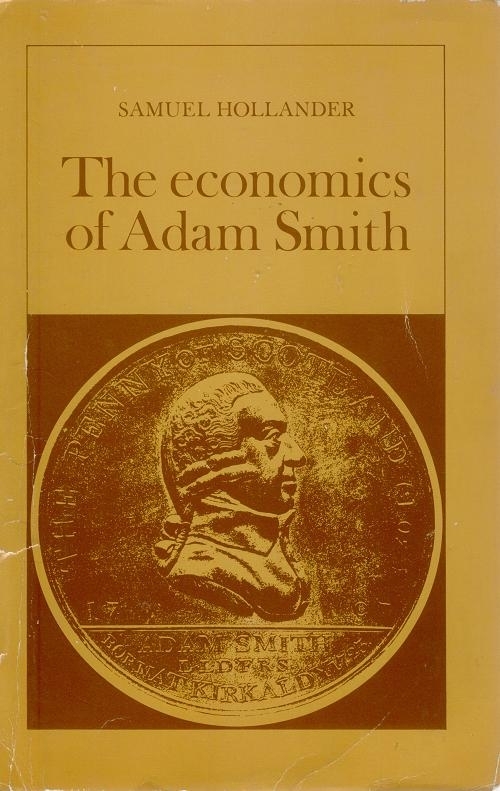 Of the many works which have been written on the economics of Adam Smith, this seems to me to be by far the best I have ever read. It shows an exhaustive acquaintance with the text to be discussed, a profound analytical grasp of the various issues raised in its interpretation, and a logical classification of its subject matter which is intellectually extremely satisfying …. One of the most distinguished essays in the history of economics thought of the last quarter of a century. Professor Hollander tells us in his preface to this book that it is intended to be the first of a series devoted to the major classical economists (Smith, Malthus, Ricardo, J. S. Mill, and Marx). This is a spectacular and ambitious commitment, and the fact that so able a scholar as Professor Hollander has entered into it will be greeted with pleasure by all economists who are concerned with the history of their discipline…. Altogether, then, this is an interesting, important, and in some respects path-breaking book. Even if Professor Hollander is sometimes apt to make it hard for us to see the wood for the trees, it remains true that the particular trees he has selected for study have rarely been dealt with so thoroughly and effectively. If the remaining volumes in his planned series turn out of the same caliber as this, his total contribution to the history of economic thought will indeed have been a remarkable one.